Everyone who has played World of Warcraft asks themselves at some point, “Isn’t there a faster way to level?” The answer to that question is instance leveling, but the benefits don’t stop at the ability to level your toons faster. There are many other benefits that you will never experience if you don’t try your hand at instance leveling. One of the most subtle benefits of instance leveling is the fact that you’ll have access to better gear. There are three ways you’ll be able to get better gear. The first way is through direct loot drops, especially off of the bosses. The bosses in the instances will drop much better gear than anything you’ll find while questing on your own. The second way you’ll be able to get better gear is through rewards from instance quests. The rewards from instance quests will be much higher quality gear than any of the rewards that come from solo quests. The third way of acquiring better gear through instance leveling is a little iffy, at least in terms of the items you end up with. Every time you complete an instance, you’ll earn a bag of goodies at the end. There will always be a piece of blue gear in the bag, but that piece of gear won’t always benefit you. It may be for a different spec than your character, or it may be one you already have. However, it is still very helpful to have those bags of gear from instance leveling. Besides, even if the gear doesn’t help you, you can always disenchant it and sell the enchanting materials or sell the gear to a vendor. Either way, you end up with more gold than you had before. 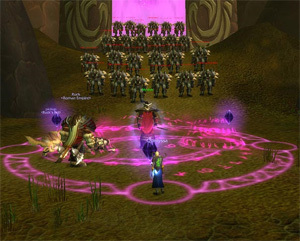 Instance leveling also involves much less down time than solo questing always did. Sure, you’ll die sometimes, especially if you play one of the squishier classes, but if you’re the only death in the group, then the healer will be able to resurrect you. If the healer dies, then some of the other classes do have resurrection powers also, so it means you probably won’t have to run back and get your corpse. This aspect is a huge time saver. There are also a lot more mobs packed into an instance than there are out in the solo areas. On average, you’ll be able to get more kills per second when you’re in an instance because there are more monsters in a smaller area. Being in a group of five people ensures that you’re able to handle these larger mobs of creatures. More time spent killing means more experience and levels that come a lot faster and easier. When you started playing World of Warcraft, you may not have expected the huge world that allows you to play with other people you’ve never met. But isn’t it a lot more fun to play things together? After all, you’ll be able to take down bosses that are a lot more interesting than the ones you’ll run across while questing alone.